Cruise Lines are monitoring the first major storm of Hurricane season which is already impacting cruise ship itineraries in the Gulf of Mexico and the Caribbean. The good news is that Subtropical storm Alberto is not expected to become more powerful and won’t become a Hurricane. 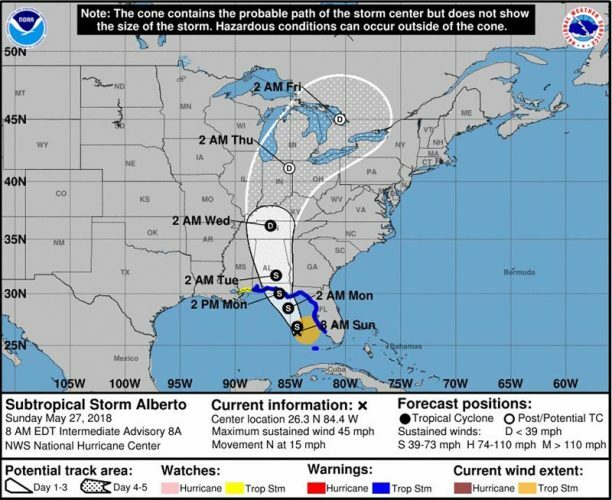 With Subtropical Storm Alberto currently in the Gulf of Mexico, cruise lines are keeping a close eye on its development to make sure cruise ship passengers and crew stay a safe distance away. At the moment according to Cruise Critic, Carnival Cruise Line has already changed itineraries for Carnival Valor which is based out of Galveston, Texas and Carnival Fantasy based out of Mobile, Alabama. The storm has already moved from the Yucatan Peninsular in the western Caribbean and those itineraries are expected to arrive back at their homeports on scheduled. Now that Alberto has already moved into the Gulf of Mexico there could be further changes. Carnival Cruise Line ambassador John Heald has already posted that the Carnival Dream departing on May 27 from New Orleans and Carnival Fantasy on May 28 from Mobile are being monitored. Other cruise lines which have ships in the area have not yet announced any itinerary changes but of course, will be making sure their ships are not affected by Subtropical Storm Alberto. 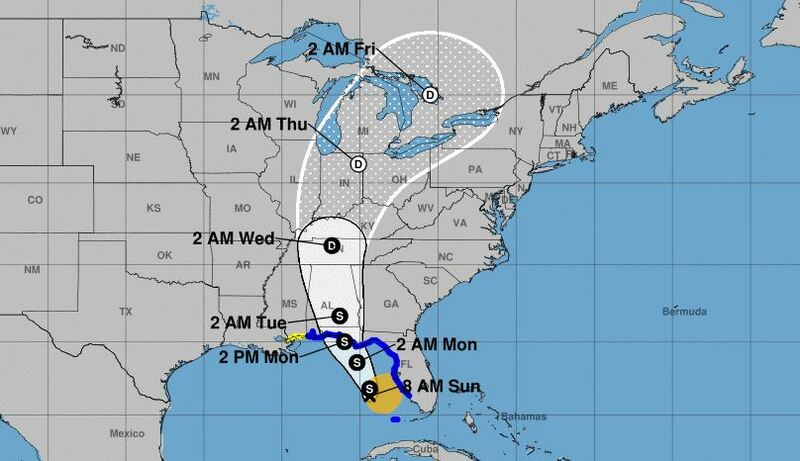 According to the National Hurricane Center (NOAA) the storm is currently located 265 KM southwest of Tampa, Florida and has maximum sustained winds of 45 MPH. The storm is moving north in the Gulf of Mexico west of the Florida coast. By Monday afternoon the storm will hit the coast of Alabama where there are already storm surge watches. Cruise Hive will continue to keep track of any new developments affecting the cruise industry. It also advised checking with the cruise line before your cruise departure. Norwegian Bliss which is the newest ship for Norwegian Cruise Line has been impacted by the category 5 Hurricane Willa and Tropical Storm Vicente in the Pacific. Several cruise lines have already been impacted by changing ship itineraries including Royal Caribbean due to Hurricane Michael. As Hurricane Michael begins to pound the Florida panhandle cruise lines are monitoring developments. There could be further impacts to ship itineraries and ports as the storm continues north through the U.S. east coast.